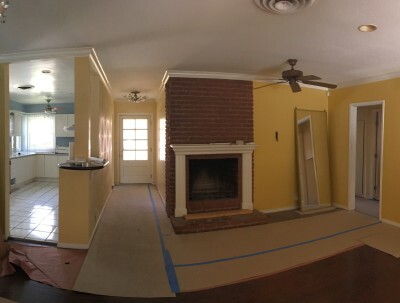 Comments Off on EPISODE 9: Apparently, I was the only one who loved our old brick fireplace!?! Designing new houses and re-designing homes from the turn of the century through the 90’s I intimately know how houses have been built through the years. During my first career as a production and costume designer on historical films, I worked in numerous aging brick structures that were 200+ years old. I have witnessed the ravages of brittle, aging brick and mortar. 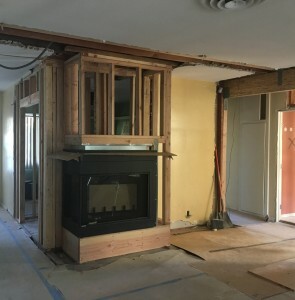 I loved the 1952 brick fireplace in our home but when the tree fell and the price quote to repair it came in at $12,000 and a new drop-in gas fireplace would be less than $5,000, even I realized we should investigate other options. 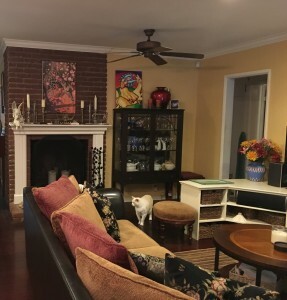 I fought hard for restoring the original fireplace, even after more than one of our design company’s trusted contractors suggested we get a new drop-in gas unit which would be an energy efficient asset to our home. I have always affectionately thought of our house as a “cabin” or a “cottage” with a central BRICK fireplace that added warmth and charm. It took a few weeks, but I realized I was the ONLY one who thought restoring the old thing should even be a consideration. As I do in any design job, I rely on collaboration with experts to arrive at brilliant ideas. Bob at Encino fireplace introduced me to the idea of a corner unit which has open viewing areas on 2 sides. 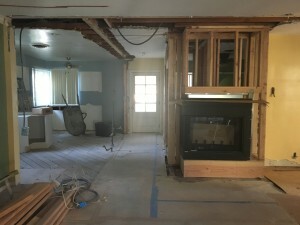 While I was emotionally attached to the old brick fireplace, the new gas unit in the heart of our home, viewable from the kitchen island as well as the living and dining room areas, sends out as much emotional warmth… and is not even hooked up yet. Stay open to possibilities! Your first thoughts may not be your best ideas. Do the research, cost out your options so you can apply the best cost sense to your ultimate design choices. Keep working on the plan until you LOVE it, especially if you are letting something go! I have been recommending my clients go to Encino Fireplace for years. Bob, the owner, as well as his staff, are so knowledgeable about interior and exterior fireplaces as well as outside kitchens that I know my clients will come back to me with the education and ideas I need to guide them. This is my thank-you to Bob. But, from this moment on this fantastic design direction will be referred to as MY IDEA! After all, I knew where to go with MY fireplace confusion!